Temperament: The Bichon Frise is a well-mannered, sensitive dog. They are playful and affectionate with a cheerful attitude and love human affection. Bichon's are independent, intelligent, confident dogs. Family Dog: Bichon's need human interaction and affection to be happy. They are very social dogs and love to be taken everywhere with the family. They do well with other dogs, pets and children. Shedding: The Bichon Frise is a very light shedder. Grooming: The Bichon's coat should be trimmed giving a natural appearance that shows off the outline of the body. The coat should give the body a round appearance from any direction. The coat on the head, beard, moustache, ears and tail is longer. The Bichon should be groomed frequently and bathed monthly. Professional grooming is recommended. The eyes should be kept trimmed and cleaned to prevent staining and infection. Training: Bichon's are generally easy to train but may be hard to housebreak. Exercise: Bichons are active dogs. They should be taken for walks and given ample play-time. Living Conditions: The Bichon Frise can make a great apartment dog if given plenty of exercise. They are active inside and don't necessarily need a yard to play in, but will definitely enjoy it. Appearance: The Bichon Frise is a small and sturdy dog with a merry temperament. They have a white fluffy coat and a plumed tail carried merrily over their back. The Bichon Frise has dark eyes contributing to their inquisitive expression. 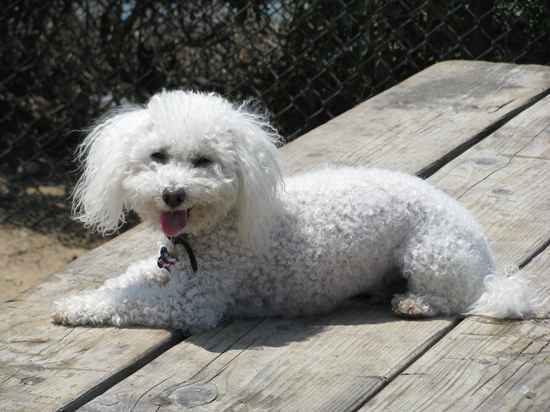 Size: The Bichon Frise should be between 9 to 12 inches tall and weigh around 7 to 12 pounds. Head: The expression of the Bichon Frise is soft, inquisitive and alert. Nose: The nose of the Bichon is very distinctive and always black in color. Eyes: The eyes of the Bichon Frise are round and black or dark brown in color. They face directly forward with halos of black or very dark brown skin surrounding them. This helps accentuate the eyes and enhances their inquisitive expression. The eye rims should be. Ears: The ears of the Bichon Frise drop and have a coat of long flowing fur. The ears are long enough to reach halfway to the nose with extended forward toward the nose. The ears are set just above eye level and toward the front of the head. When the Bichon Frise is alert the ears provide a perfect frame for the face. Muzzle: The muzzle of the Bichon Frise should be approximately 3/5 the size of the rest of the head when measured from the tip of the nose to the stop and from the stop to the occipital bone. Below the eyes is a slight chiseling effect. Teeth/Bite: The lower jaw of the Bichon Frise is strong. The lips should be black free from any drooping. The teeth should meet in a scissors bite. Neck: The Bichon Frise has a long, arched neck allowing them to carry their head proudly. The neck blends smoothly at the shoulders. Body: The body of the Bichon Frise is ¼ longer than it is high. The height of the body from the withers to lowest point of the chest is approximately ½ their height. The Bichon Frise has a compact body of medium build. The topline of the Bichon should be perfectly level except just over the loin where a muscular arch may appear. The chest is wide, well-developed and extends to the elbow. The ribs are moderately sprung and extend back to the loin. The forechest extends slightly in front of the shoulder point. Forequarters: The shoulder blade, upper arm and forearm of the Bichon Frise should be approximately equal in length. The shoulders are laid back and form approximately a forty-five degree angle with the upper arm. The upper arm should form such an angle so the elbow is directly below the shoulders when looking from the side. The Bichons' front legs should be straight with a medium build. The elbows should be close to the body. Hindquarters: The hindquarters of the Bichon Frise are muscular, moderately spaces, with medium bone density. The upper and lower leg should be approximately equal in length. The lower leg should be perpendicular to the ground. Gait: The Bichon should appear to be moving effortlessly at a trot. The front and rear legs should extend equally maintaining a level topline. The head and neck should remain erect while running. As the Bichon's speed increases the legs converge toward the center line. From behind, the rear legs should move with ample space between them and the bottom of the feet can be seen. The Bichon's movement is precise and true. Feet: The Bichon Frise has tight, round, cat-like feet that point directly forward. The pads are black. The nails should be kept short and the dewclaws may be removed. Tail: The tail of the Bichon Frise is plumed and set level with top of the back. It should curve nicely over the back so that the fur rests on the back. When extended, the tail can reach halfway to the shoulders. Color: The coat of the Bichon Frise should be white. It can have shadings of cream, buff or apricot on the body or around the ears. Shadings of colors other than white should not exceed 10% of the entire coat. Coat: The texture of the Bichon's coat is the most important characteristic. The undercoat should be dense with a soft texture and usually 3 to 4 inches long. The outercoat should be coarse and curly. The coat should feel soft yet substantial when touched similar to velvet. The coat has a springy quality and should bounce back when patted. Life Expectancy: The average life expectancy of the Bichon Frise is about 15 years or more. Characteristics: The Bichon Frise makes a good watchdog and loves to perform tricks. They are very competitive, obedient dogs. Health: The Bichon Frise is prone to cataracts, watery eyes, some skin and ear conditions, epilepsy and dislocated kneecaps. They may also be extremely sensitive to flea bites. Litter Size: The average litter size of the Bichon Frise is 4 puppies with the range from 1 to 6. History: The Bichon Frise made its appearance during the 14th century. It was bred as a cross between the Barbet Water Spaniel and the Poodle. They were originally traded by Spanish sailors. During the 16th century the Bichon became the favorite in the French royal courts. They were also popular circus performers. The Bichon Frise today is primarily kept as household pet.